It sits on the carpet-squared floor where more dirty feet have tread than I sometimes care to think about. You see, each unique foot was attached to each unique person with each unique strand of DNA and each unique story from each unique heart that that DNA helped form. It’s gold and slightly to the left, but it’s reflective. I can actually see my face as my forehead bumps into the bottom tip of continental Africa. It’s gold, slightly to the left, and reflecting more than just the face of a student fumbling to make roots in a city unaccustomed. It’s shows the gold of a laptop case, the neck of a black guitar, and the entire window-poster of another city on a coast nowhere near such current golden reflections. It’s gold, and it’s reflecting hope. Hope of a world yet unexplored by this pair of two feet. Hope of stories yet un-typed by these ten fingers. Hope of songs yet unsung by this one voice. Hope of a city yet uninhabited by this one individual with unique strands of DNA. but hope cannot be recognized unless it has a boldly contrasting surface on which to be reflected. Maybe it’s being reflected, actually, onto me. A combination of DNA and genes and spirit and flesh and ideas and hopes and dreams and doubts and confusion and good-intentions and exhaustion and fears and beliefs and frustrations and deep worries and underlying desires. A combination of a love of words and a despising of words, of addiction to change and terror of discomfort, of a love of revealing and yet an obsession of being hidden and still unknown. (It often comes out through the words, you see). Of a love of revealing and yet an obsession of being hidden and still unknown. songs I long to sing the message so sweet that the feet start to move and change is unlocked. Who sometimes wishes it were a responsibility she could wish away. Me, who sees her imperfections and tries and tries and thinks and tries not to try anyone. Me, who feels this song but feels a deep desire to do anything but share this song. Me, who is fumbling to learn how to live and fumbling to see the reality of the Giver of Life. Me, who has entered a place, who feels still unknown, and who feels frustrated by this on the inhale and numbly content with it on the exhale (for, sometimes an unknown future is more welcome than an unwanted reality). 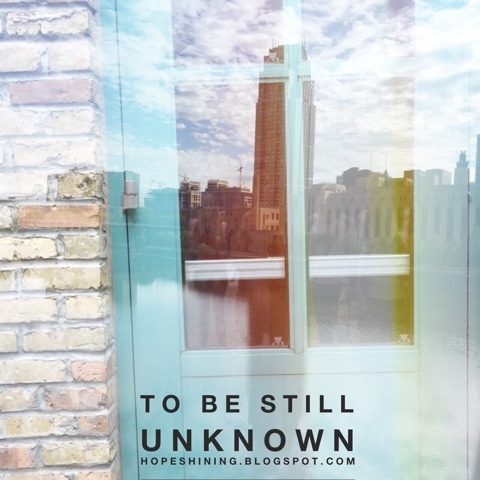 You see, it’s comforting to be still unknown because, then, you cannot be rejected for who you are revealed to actually be; you cannot fail because you have not ever stepped into the realm of the known. That’s a deep form of self-obsession, compulsive control-mongering where joy is dead and life feels like death. You see, that’s where a death is needed, but not a death of all things that point to and reflect glorious, golden hope; it’s a death of self that is needed. It’s a death to the fear of being known, rejected, and exposed as lacking and failing. It’s a death to the laziness and self-obsessive, selfish behaviors, habits, attitudes, and actions that try to stick this fear as glue onto the very mind and heart of humans. It’s a death to self and an awakening to life. It’s a trading of being still unknown for a being still to be known. It’s a death to self and a taking on of humility that comes into the presence (His presence) in a state of surrender and is still. It’s a coming into the presence and being open to what the King is doing, to listening and obeying moment by moment, breath by breath — realizing that this is enough. It’s a stepping into the presence in this open, courageous obedience to go further up and farther in, into the realms of a founded joy, hope, and peace and into the realms where the anti-hope reality of our flawed, broken DNA strand hearts become flooded with reflecting the hope of the King. For this is life — soaking in the Story so that we may be fueled to fully embrace our stories as we walk along as residents never home but reflecting hope on the canvas of a world dark and needy. This is death. But (oh), this is life.